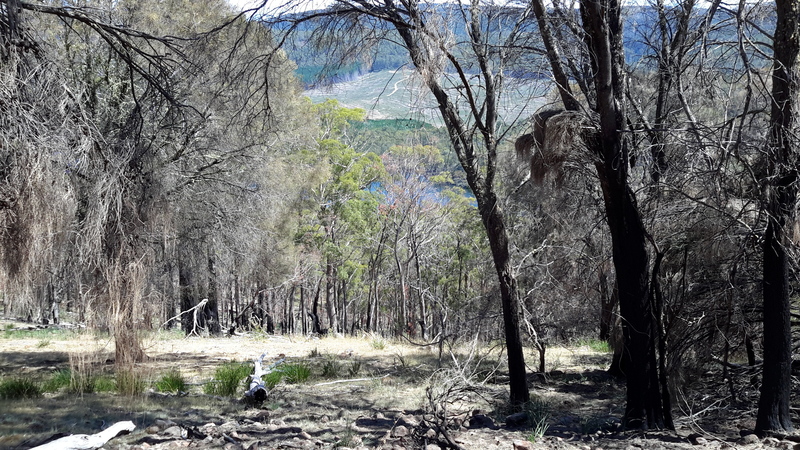 The signs of a past bushfire were clear on one long hill. Possibly a year ago. A little green regrowth in evidence. 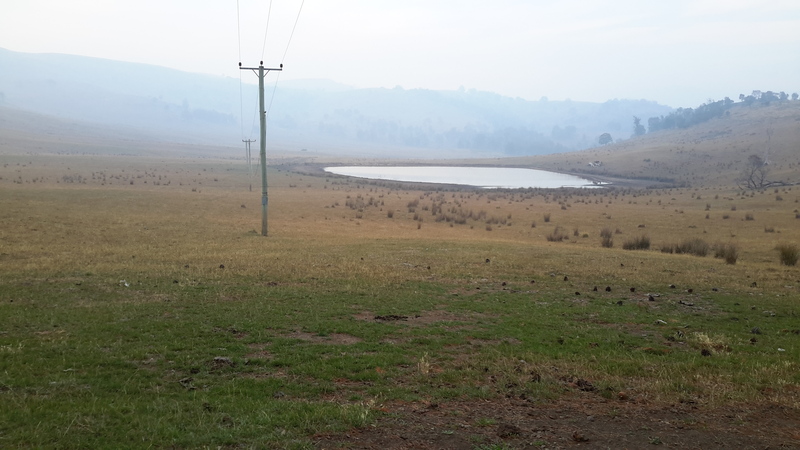 Nevertheless seeing the blackened trees was a timely alert and made me wonder how I would cope if a bush fire came my way. I have been informed the safest place is to find/create a hollow in the ground at the bottom of a hill, dig in and cover yourself as well as you can (remembering that most bushwalking gear and clothes is synthetic and will melt), hope the fire will flash over you quickly and that no trees or burning branches will fall on you, wait until the rush has passed, and then hope you can see somewhere to go. I don’t ever want to put that to the test. On the evening of this walk, I dropped off to sleep around 7.30pm (early to bed early to rise!) 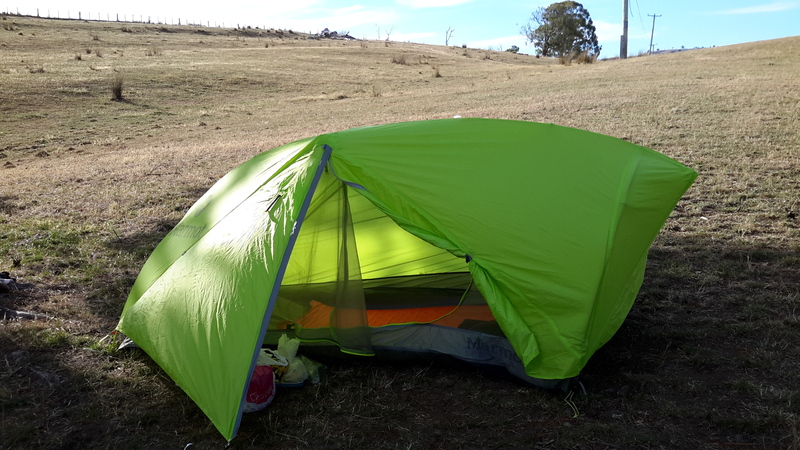 in my trusty little synthetic tent on the only flat place I could find during almost the entire walk. A little after 9 pm I woke to the smell of smoke. Hmmmm. 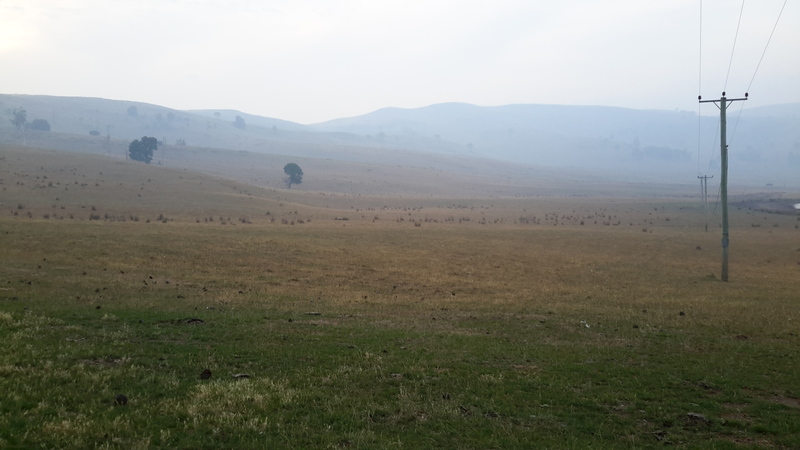 I clambered out of the tent to have a look; 360 degrees of hills were softened with smoke haze. No wind. I couldn’t guess the direction from where the fire smoke might be coming. When I considered collapsing my tent, repacking my backpack and continuing onto the Catagunya complex, I realised it was possible the fire was flaring between me and that destination. I listened for the sound of helicopters doing water drops. Heard nothing. 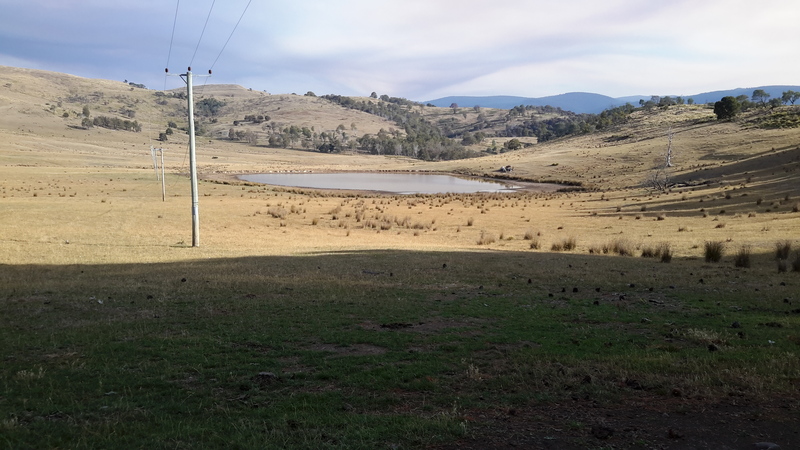 A couple of hundred metres below me was the dam with its thick brown water (photo below taken when setting up before the smoke haze arrived) which I felt was the safest place I would find close by. Thought I was safest staying put. So I climbed back into my hot sleeping bag (the evening temperature didn’t cool as forecast), and went to sleep. In the morning, I took the following photos. 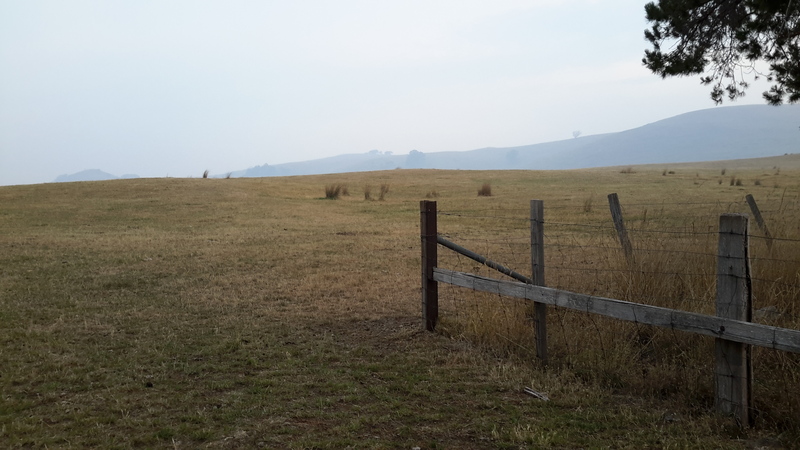 They show the smoky cattle-crossed hills surrounding me – and indicate the smoky air I was breathing. I packed up and walked passed another smaller dam, before travelling around, down and up hills once more. The smoky haze persisted. Didn’t seem worse. I continued. 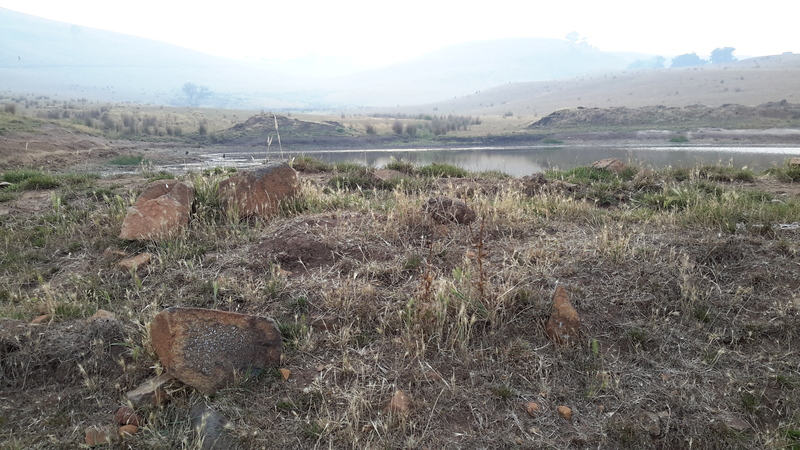 When I saw Catagunya Dam in the distance with the haze behind, I knew the seat of the fire was elsewhere. 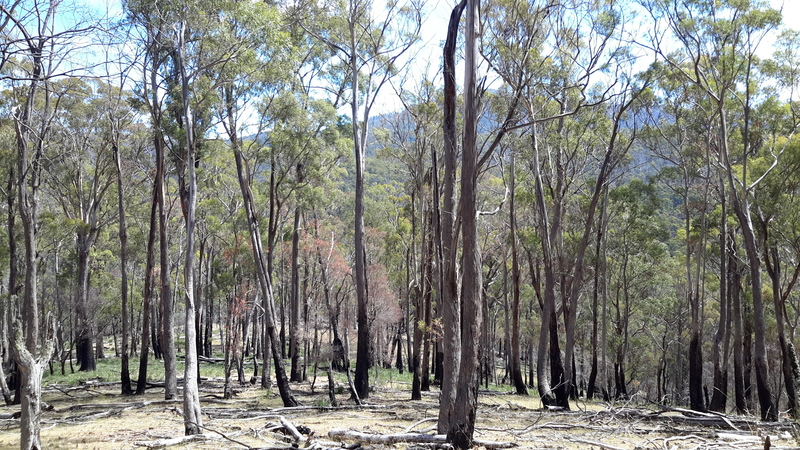 Later, I learnt the fire was over 70kms away in the south west of Tasmania. 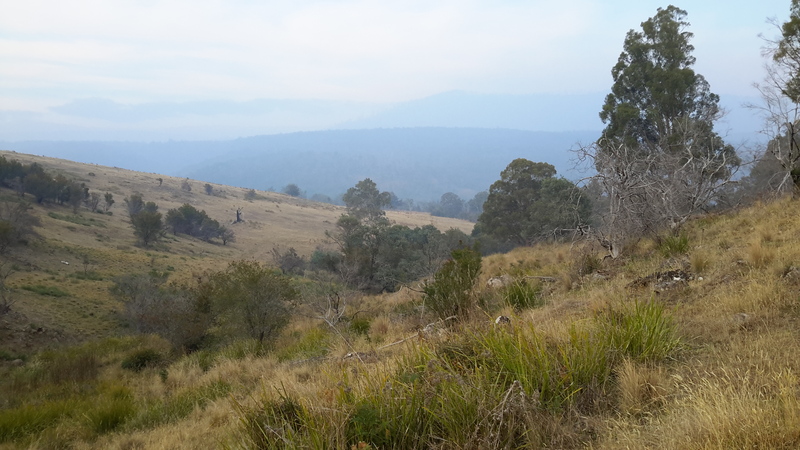 Strong winds were responsible for creating the haze and even Hobart way east was blanketed similarly by smoke from the same fire. 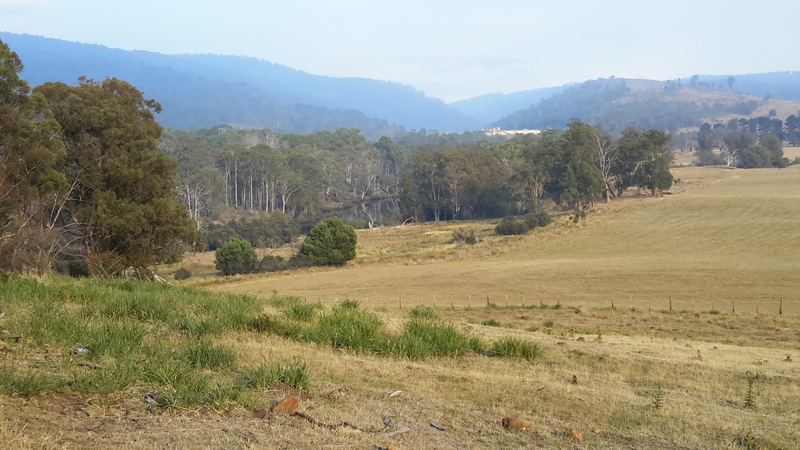 This entry was posted in Derwent River, Tasmania, Walking and tagged bushfire, Catagunya, Catagunya Dam, dam, fire, Lake Repulse Dam, smoke on February 29, 2016 by Tasmanian traveller. We do have forest fires in Canada however the thought of being caught in one has never crossed my mind. To have those stimulation of the senses from seeing the new growth and then smelling the smoke really must have your mind thinking of the scenario. It definitely would have been for me. Massive fires have burnt out large sections of Tassie over summer, and with strong winds every other part of the state has smelt the smoke. It is always a reminder how lucky one can be. Awesome views in my eyes. 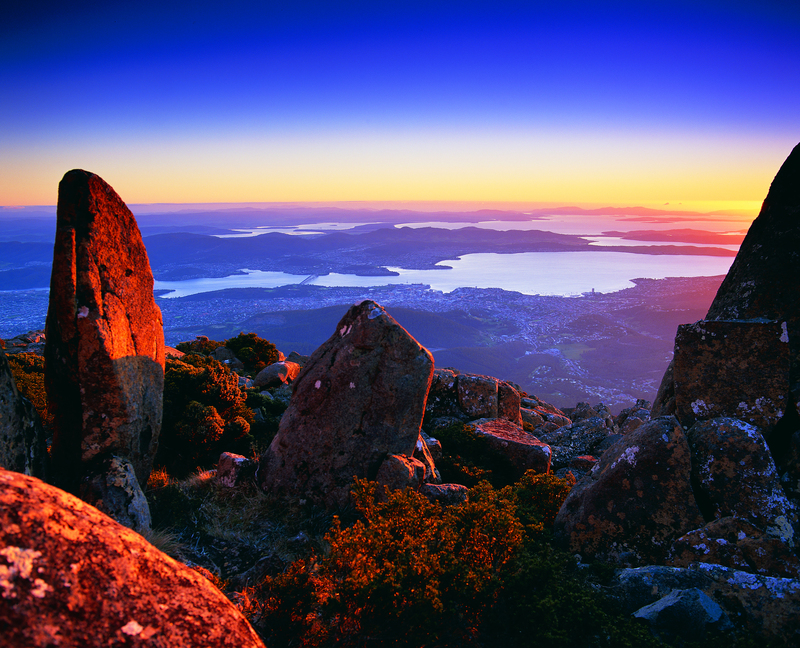 I thought they were awesome – extraordinary landscape and so wonderful that it is remote yet not so far from Hobart.